Owned with Land of Promise Farms, VA, Sharrett Family Farms, OH, Lettow Showpigs, IA, 4K Farms, IA, Coe Farms, OH, Nathan Ray, IL. Sugar Daddy has been as dependable of a sire as we have ever used here. I term Sugar Daddy as a “Big Picture” sire. By that I mean that he will sire the same traits across the board regardless of the type or pedigree of the sow. They will be tall shouldered, level spined, good hipped, correct, and attractive. They are easy to sell, yet have the right maturity, and are not quitters. Let your sow determine the extremes you are trying to accomplish in terms of bone and muscle. In order to get extreme muscle or extreme bone, take him to sows that are extreme in those two areas. 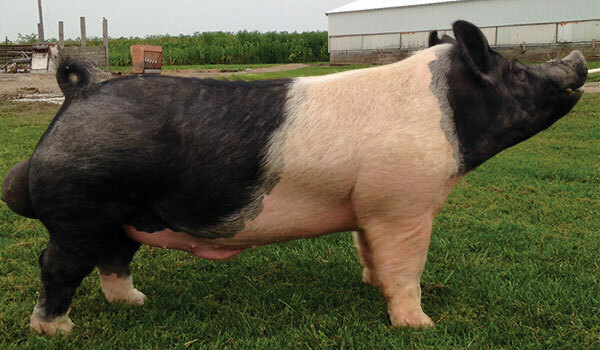 The barrows and show gilts out of Sugar Daddy have proven they can win at the highest levels. What’s become apparent recently is that his daughters are elite generators. They are easy to breed, easy to farrow, great milkers, and consistently generate quality. Use Sugar Daddy to make barrows that can win while you keep those sisters to strengthen your sow herd. His impact will be felt in our program for decades to come. This form will serve as a request. It is not an official order. After submitting this form, someone from the boar stud will contact you to verify your order. If you would prefer to call in your order, please call Toll Free 866-4-MUSCLE or 740-437-7478.